In this cartoon it shows pope Benedict holding a lotto ticket that he bought; en front of him is a TV screen showing the result of lotto, the Pope holds the winning ticket. The Pope is saying or thinking: Holy sack of straw, I'm quitting [my job] tomorrow (as translated from German). The astonishing thing in this cartoon that it was made a year and a half ago by Katharina Greve who originally drew the cartoon for the Frankfurter Allgemeine Sonntagszeitun. It then appeared in the 2013 "Karicartoon" daily page-a-day calendar on Sunday, February 10, 2013 -- the day before Pope Benedict XVI announced he would step down from the papacy. Another astonishing thing are the numbers. "28" is the day that he actually will step down and the currant secretary of State for the Vatican Cardinal Tarcisio Pietro Bertone will be called upon as Camerlengo to serve as the head of the Roman Catholic Church in the period knowns as 'sede vacante' untill the election of a new pope . Note the number "13" which can be year 2013 specially if wethe "2" from 12 and the zero from the 10 and put them before "13" completing the date of year 2013. Then after there remain the two "1"s which indicates the day the Pope announced his resingnation --Monday 11. Also the first "13" indicates the last mass he held on Feb. 13 at Ash Wednesday. It remain the number "23" and "6" the meaning of which sjould be clarified in the coming days. Also, On Holocaust Remembrance Day at the end of January, Pope Benedict released a white dove of peace -- which was then promptly attacked by a grey-wingedseagull. This means that War is coming and peace dying. In news most are speaking about the coming new pope to be an anti-christ during his papacy the Rome and the Vatican are going to burn because of warlike tribulations, they call the next pope Peter the Roman as called by a certain Mallacy seer who made predictions about 112 popes. Number "23" appears to have been solved because on Saturday February 23 Pope Benedict will have a meeting with Italian President Giorgio Napolitano the subject of talk and discussion is anyone quess, but according to some Italian media sources the Pope will ask for protection and immunity from prosecution from the Italian government for any wrong he might have done, such as protecting child pedofiles among the Catholic clergy. Tradionally the popes are above the worldly laws but the pope might be asking for forgivness and pardon. It still remains the superball number "6" to be solved. On the same day, February 11, when the Pope announced his resingnation starting Feb. 28, at the evening a lighting strike near or at the Vatican due to a storm at evening time. The pagan god Zeus is known for throwing lighting bolts at people. Who takes for himself the name of [Pius 13]. " That prophecy states: "During the last persecution of the Holy Roman Church, a pope will sit on the throne of Peter who shall feed the sheep amidst many great tribulations as a result of which the City of the Seven Hills [Jerusalem] shall be utterly destroyed, and the awful Judge [Jesus Christ] will judge her people [because of rejecting Him]." Having made that clean (and by that made fools of those thousands who believed and still believe "Peter the Roman" to be a code name for the last pope) let us do some hunting for the identity of the next pope, who as a matter of fact would not be the last one. That prophecy say there is going to be tribulation, much destruction and a devastating storm; however after each storm the sun shines again. So a renewed papacy with a renewed pope will take the helm of the Catholic church. Cardinal Marc Ouellet is on focus, he is the Canadian-born former Archbishop of Quebec who now heads the powerful Congregation of Bishops that is a "great spot for making friends and influencing people," since it chooses the global leadership of the church. Ouellet, 68 years old, is a veteran in dealing with the secularized West, someone smart, intellectual and cosmopolitan. He is close to Benedict16 in theological thinking and someone who could bring a strong hand to the Vatican bureaucracy. His is both traditional and innovative at the same time, someone Vatican is looking to maintain the balance in the house between the traditionalists and reformists. And to navigate the church during the currant crisis that she is going through during which the Catholics are leaving their churches, so far 22 million Catholics left their churches in the U.S alone. Vatican would be needing a new pope with messages that will attract those abandoning it or preventing further bleeding. He must be able to speak to the hearts. -He has to be deeply concerned about the poor and about works of charity. Who takes for himself the name of [Benedict 17]. " Edited by man, 04 March 2013 - 09:13 AM. Who takes for himself the name of [Peter II]"
Patriarch Bechara Boutros al-Rahi was created a Cardinal by Pope Benedict XVI in a consistory on 24 November 2012.On Thursday, 31 January 2013, Cardinal Patriarch al-Rahi was appointed by Pope Benedict to serve as a Member of the Congregation for the the Oriental Churches and. 72 years old Cardinal was born in Lebanon, his name al-Rahi means pastor in Aramean/Arabic, pastor as in Jesus the Pastor. He took the additional name Boutros, which is Middle Eastern pronunciation of the name of Saint Peter, the Apostle who who briefly held the See of Antioch before moving to Rome to become Bishop there, or the first pope. 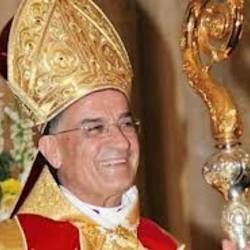 Bechara was was consecrated as auxiliary bishop of Antioch on 12 July 1986. In April 2011, the acting Maronite Patriarch Rahi said that, for the sake of communion and love, he would work "to establish a sincere and complete dialogue" with Muslims "and build together a future in common life and cooperation." In 2007 he received the award of the National Order of the Cedar. In 2011 he was decorated with the Grand Cross of the Legion of Honor by the President of France Nicholas Sarkozy. Since he is a Cardinal, he is eligible as a candidate for the papacy, a papabili from Levant in turmoil, the land where first Jesus and His followers preached. He is likely to get the 72 votes needed for becoming pope. A warrior for peace in the Middle East who speaks Arabic, French, Italian and Spanish.